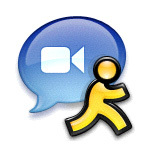 iChat AV is Apple Computer's personal video conferencing software for Mac OS X (10.2.5 and higher). 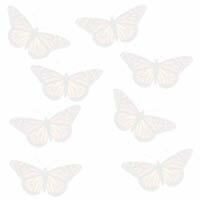 We have big plans for the future - we hope to connect with Monarch Watchers and provide an easy way for Monarch Watchers to connect with each other as well. We held our first "official" video conference with a class on November 12th 2003. We connected with Karen Vitek and her students at Nassau Spackenkill School in Poughkeepsie, New York (over 1100 miles from KU, by the way ;-). The students asked questions and Chip (Dr. Taylor, Monarch Watch Director) in turn asked questions of them. Our session lasted about 35 minutes and overall it was a good experience. We learned a great deal about the promise and limitations of this technology. One limiting factor was the webcam. The iSight camera we used was designed for one to one communication via iChat AV and it's excellent for this purpose; however, it is difficult to communicate with a large number of students and use the camera for show and tell lessons. The solution? Almost any firewire-capable camcorder connected to your Mac may be used with iChat AV. A camcorder allows you to move the camera around and zoom in on a range of objects (or individuals within a group - such as a student asking a question). Another feature that's helpful, particularly on the classroom end of the communication, is an LCD projector. The projected image allows a large number of participants to see the interaction between Monarch Watch and the students. Unlike standard video conferencing, which is often technically challenging and expensive, iChat AV is very easy to implement and virtually free, since many schools already have all of the necessary equipment (see below). - A Macintosh computer (iMac, eMac, tower, iBook or PowerBook) with a G3 processor running at 600MHz. - A Macintosh computer (iMac, eMac, tower, iBook or PowerBook) with a G4 or G5 processor running at 1GHz or higher. Note: iChat AV is included with Mac OS X Panther (10.3.x) and Mac OS X Tiger (10.4.x). Learn more about iChat AV. 1. Assemble all of the necessary equipment (see above). 2. Create AIM or .Mac ID if you do not already have one. 4. Configure iChat with your AIM or .Mac ID. 5. Read through all of the information on this page (check back often for updates) and in our guide on Conducting an iChat AV Session. 6. Send us an email at monarch@ku.edu with your iChat ID and a time when you will be available (with iChat running) so that we can test the connection. 7. We'll connect and decide on a date and time for an iChat Session with your class/group.